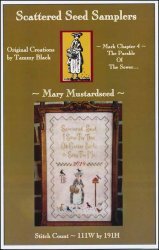 Mary Mustardseed [H5227] - $12.00 : Yarn Tree, Your wholesale source for cross stitch supplies. A sampler to honor your feathered friends. Verse reads "Scattered Seed, I Sow For Thee, Oh Gather Birds & Sing For Me. Cross stitch design from Scattered Seed Samplers. Stitch count 111w x 191h.